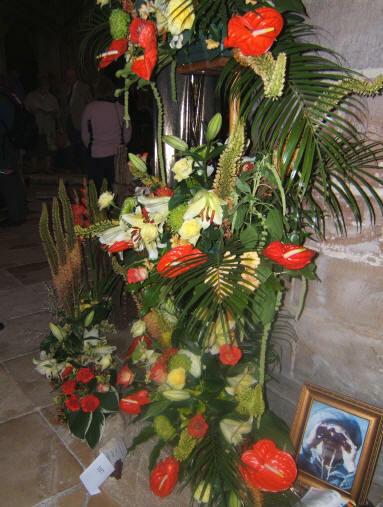 Our flower arrangers at St Nicolas' were invited to display flowers at the Gloucester Cathedral Flower Festival on the weekend of 28-31 July 2005. 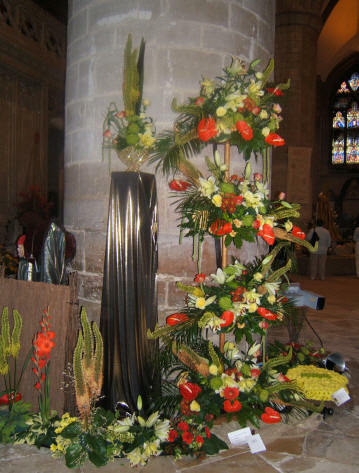 Lindsey McGowan says, "From Thursday 28th to 31st July Gloucester Cathedral held a Flower Festival entitled “Glorious Gloucestershire”. Molly Campbell and Lindsey McGowan from St Nicolas represented the Parish of Prestbury with their display depicting “Prestbury Park Racecourse”. 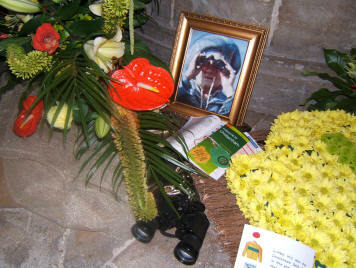 "Funds were raised through well attended coffee morning, cream tea and a number of generous donations. 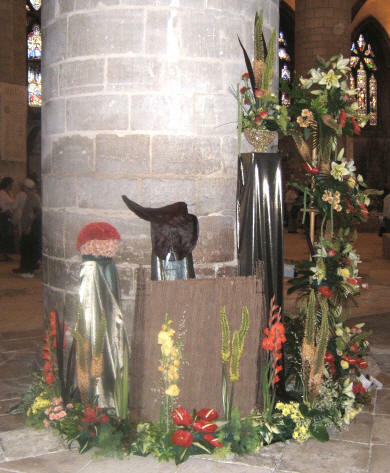 Preparations for the festival took several weeks of meetings and hard work and included creating a full size saddle from papier mache and leaves, a jockey’s cap and racing silks made of flower heads in the green and gold colours of Limber Hill, who won the Cheltenham Gold Cup in 1956. He is one of the horses who has a road in Wymans Brook named after him. We also built a hurdle and camera to complement the display. 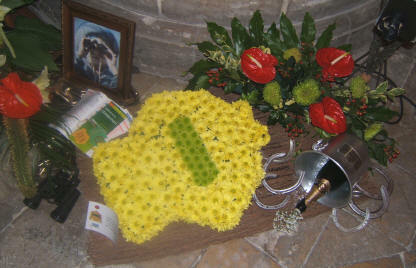 "Husbands were enlisted to help with transport and staging as well as dismantling on Monday 1st August. The actual arranging took place on the Wednesday and though it was hard work it was also great fun to be part of such an enthusiastic crowd of arrangers from various Parishes throughout Gloucestershire. All of the displays were absolutely stunning and enjoyed by a huge number of visitors. "